The private equity (PE) model is well established. PE investors analyse hundreds of companies and opportunities in detail before buying a minority or majority stake in a good company, which they manage over a few years with the goal of achieving a profitable exit. Rarely do PE funds deal with write-offs, and PE-owned companies in distress are known to do better than their publicly listed peers. The venture capital (VC) model follows the same approach. Partners in venture funds review over 100 different opportunities to pick one winner and build, over a five-year investment period, a portfolio of 15-20 start-ups. They screen against multiple criteria, yet the industry as a whole has a pretty weak track record. Statistically, according to Correlation Ventures, over 60 percent of all companies that VCs invest in return less than the invested capital. We asked: Can this model be improved? 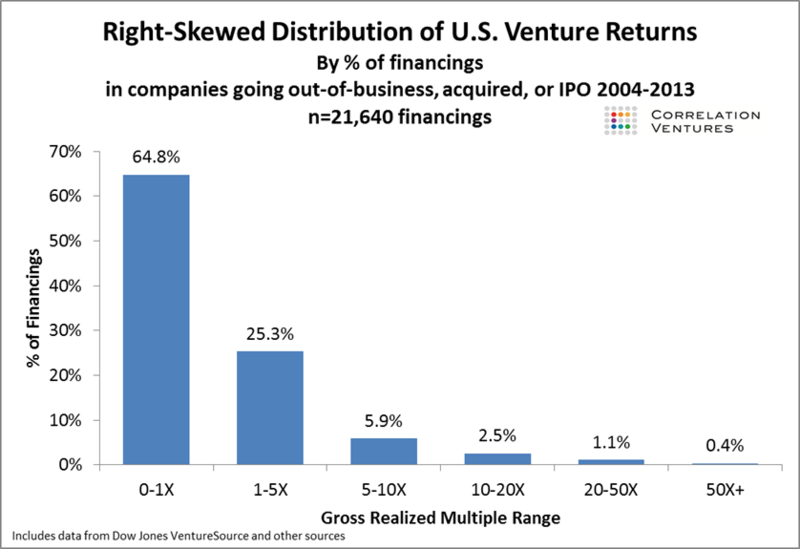 The Correlation Ventures data on VC returns shown on the graph above is quite discouraging. If two thirds of companies are largely written off, you need the remaining third to average at least a 6x return. For this you need several 10x deals, which VCs on the whole pick only 1 in 25 times, or one 50x deal, which VCs pick only 1 in 250 times. The reliance on rarely picked mega-winners makes the asset class very risky; the large fraction of losers picked depresses total returns. The Kauffman Foundation, an active venture investor since the 1970s, supports the above data with actual investment results from its portfolio: Under one tenth of its VC funds returned 3x or 13 percent annually after fees, while over 40 percent of its funds showed negative returns. The median return in Kauffman’s portfolio was 1.3x or 3 percent annually. This makes the whole asset class questionable from a risk/return perspective. Unsurprisingly, many institutional investors refuse to invest in venture capital at all. Many attempt to reduce risk by restricting themselves to funds or managers with demonstrated past success. Besides its false positive problem (two thirds of its portfolio companies failing), VC also has a false negative problem. It is easy to miss the big winners that can make early-stage investing worthwhile. Bessemer Ventures Partners, one of the world’s oldest and well-known top-quartile VC firms, openly shared its anti-portfolio, i.e. companies it had the opportunity to invest in, but passed on. It includes Google, Facebook, Paypal, eBay and other top companies that were turned down by its partners – and at the time for solid reasons. For instance, the firm felt that Friendster’s position meant Facebook had no chance. Is the takeaway that VCs – despite having smart teams – merely roll the dice? Is it that the future is inherently unclear at such an early stage in a company’s existence? Indeed, data clearly show that venture capital is fundamentally different from private equity. VCs invest at an earlier stage, when little is known about a company. So why treat it like a private equity business when the information available at the point of investment does not allow for a traditional due-diligence process? Why not just accept that we do not have all the information needed to pick winners? A weakness of the ‘spray and pray’ approach is the ‘pray’ element. You scatter money and hope things will work out, with limited follow-on investments in the successful ones. What if the ‘spray’ part (i.e. investment process) wasn’t treated like an investment strategy, but like a Texas hold’em poker game instead? In poker, you invest a tiny amount in ‘table stakes’ to see what hand you will be dealt. If it looks good, you then bet more to see the next card. In each subsequent round, you decide whether to give up and fold, or bet more – sometimes up to 50 or 100x your initial table stake as the game progresses. In other words, what if you treated the ‘spraying’ like a data-gathering opportunity? While this is time-consuming work and not suitable for casual angel investors, it is possible to use early-stage investments to gain inside intelligence on a company’s prospects, the founding team’s skills and the company’s development over time. This gives you an information advantage when making follow-on investments and maybe (just maybe) even helps in predicting the future. VCs still can’t predict the future perfectly. But they will know whether they are better or worse off – i.e. whether the company is trending upwards, has stalled or is in a downward spiral. In fact, poker aficionados will agree that the last situation will be the most obvious. Poker players can often see after just a few cards that their hand has very little hope, whereas a winning hand may only show potential after more cards are drawn. The secret to winning consistently in poker is to cut your losses early on your bad hands and to keep re-investing in those that still have potential based on the additional information gathered. So why not use the same approach in early-stage VC investing? Kamal Hassan (INSEAD MBA '93D) is a founding partner of Loyal VC. Great article, makes a lot of sense. I believe that 500 Startups have a similar investment thesis. Yes, the principle is the same, only 500 Startups doesn't take it very far. They only do 1 round of follow-on betting after the 'ante', and don't lead the next round, only follow someone else's decision. I like the setup but the ending has a lot to be desired. Early stage VC funds already do this to a certain extent. A series A investor typically meets founders when they are raising their seed rounds and follow up with them every few months to track progress, traction, growth. While they're not getting "insider information" such as access to board meetings, they are getting enough information to help reduce uncertainity on many areas related to the business. Similarly, stage agnostic funds do this as well. They invest a bit earlier and then seek to increase their position going forward if the company is doing well. However, this system has a negative effect in that if the fund does not lead the subsequent round, it is a negative signal to the rest of the VC funds. Thats why fund like Eniac invest in only seed - because they want to avoid any negative signals. Last thing is that if a startup is doing very well, the subsequent rounds of financing is incredibly competitive with mulitple funds wanting to lead and oversubscribed rounds. And the founder would be smart to bring in new investors such that they can bring more smart minds and new resources into the company. Sometimes existing investors are pushed off from even maintain their prorata when a big investor comes in at a check size and ownership stake that they specifically want (ask Sequoia - lol). So great in theory, but hard in practice. Yes, early stage VCs do this to an extent. And they have highly limited follow-on information arriving at uncertain future intervals if at all. Hence 'to an extent'. Why not commit to doing it wholeheartedly? Yes, stage agnostic funds also do this to an extent. And yes there is absolutely a negative signalling risk that constrains stage agnostic funds (though the best investors think independently). There is also large upside to betting more on what you feel certain are your best hands. Just because there is some downside, doesn't mean your fund can't be much more profitable from taking the upside. And yes, many later rounds of financing are very competitive, and some - especially large American - funds like to push out earlier investors. This really becomes a question of whether loyalty to the earlier investors outweighs the promises and demands of the later investors. (Hence our fund's name 'Loyal VC'.) Some founders won't stay loyal, while others will and will tell later investors 'no, you can only have this much'. I chatted a few months back with one founder who successfully did this to Softbank in the past year. Good article that takes some of the hot air out of the VC investment space. The principle is known to most experienced early stage investors I think, but human psychological plays a role at both sides. When dare we let go? Does a poor quarterly result before an investment round mean fold? And will you be on the shortlist of the most promising entrepreneurs? I am sure we can improve by using data better, but I wonder if quarterly financial performance data gives the full picture. Kamal Hassan is a founding partner of Loyal VC.